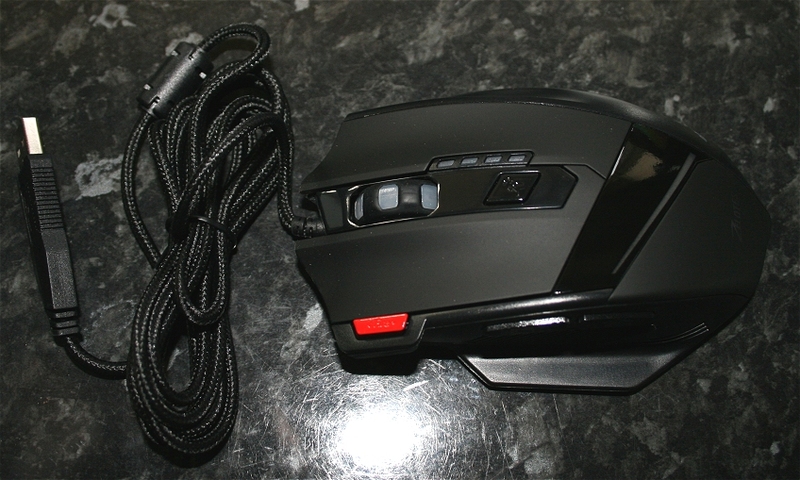 Here is a gadget which could take some getting used to, the Mad Spider Redemption Gaming Mouse. When I first saw this I thought oh look at all those buttons and lights – totally confused!!! This is a gaming mouse designed with both style and functionality in mind – lets take a look at this red hot finger bashing Zelotes gaming mouse – the T-60 or Mad Spider Redemption! When you attach it to the USB port on your computer, and then boot up the machine, the mouse fades between different colours as it goes through the boot up process. Whilst these colours look nice, the Mad Spider actually uses these to inform the user of the current status of the function “gear shift” for changing the tracking speed of the cursor on the screen. We will come to that in a bit – lets take a look at the styling first. Taking one look at this beast and you know its more than just a spider – it looks mean and it means business. It is quite a large mouse, (many gaming mice are), and it feels chunky and ready to blast the enemies to bits when you have your hand on it. Take a close look at the mouses “tail” – it is braided with nylon and is extremely flexible. In the past, mice I have had tend to have less bendy cable and it can sometimes get in the way. With this cable, it is hardly noticeable because as you move the mouse it bends so easily there is no hinderance to movement. It is also very hard wearing – so there are hours of play to be had before it wears through. Notice also from the image above that this is a USB mouse. I installed it into a Windows 7 PC on a spare USB port and windows found it and was operating it with no extra software required at all. The first game tested was Geometry Dash – my son got hold of it and enjoyed the way it moved and felt – claiming he had managed to beat his previous high score because of the performance of the gaming mouse over his scruffy little old one. However, this game is really just a case of pressing Jump and navigating the obstacles as the screen scrolls, so I thought I had better take a look at how it works on other games aswell – plus of course – how it works with a browser, as the last thing you need is to have to unplug the mouse and put a traditional model back in when wanting to switch over from gaming to surfing the internet. So far as using it to surf the web, I found that there are two buttons on the left side which allow for emulating a click of forward or back on the browser – this is known as Fast forward or fast backward. Instead of traversing up to the top left of the browser window and clicking on the back/forward icons, you can leave the mouse pointer in position on the screen and just use your thumb to sideclick one of these buttons as appropriate. Both in game, and at desktop or browsing, the DPI cycle button can increase the speed of the mouse pointer through a series of pre-set DPI resolutions. 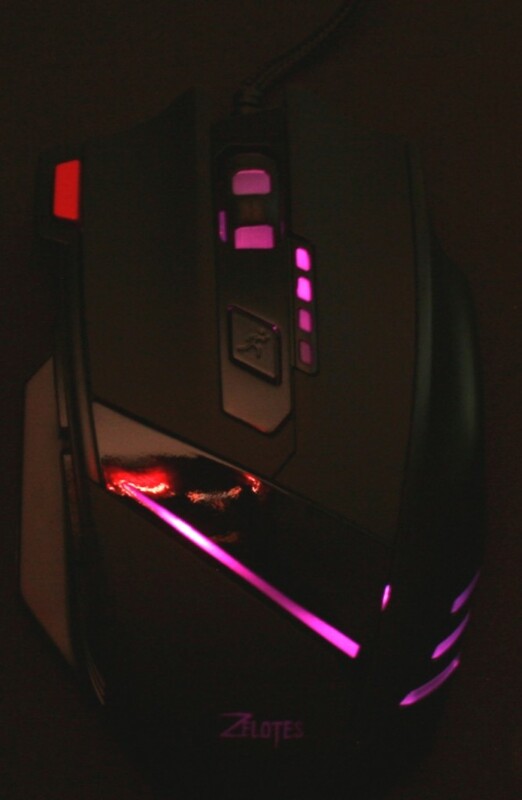 Starting at 800 and highlighting the mouse lights in RED, each click of the DPI button increases through the range and changes the colour of the lights so that the user knows where he or she is upto. The range is, 800-Orange, 1600-Red, 2400-Green, 3200-Blue, 5400-White, 7200-Purple. The higher the number, the faster the mouse pointer will zoom across the screen. When the button is pressed on Purple, the cycle restarts at 800-orange and the mouse slows down. You can set this as you go – in other words whilst running a game, there is no need to go into the mouse configuration utility in windows control panel for example. This is the Gear Shift! You can change the burst rate of firing by clicking a firepower change button. This increases the rate of fire produced by the mouse by streaming more clicks on the left normal mouse button automatically into the program running. 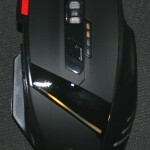 There is a high response rate with zero delay between the mouse and the CPU – this allows for faster smoother gameplay. 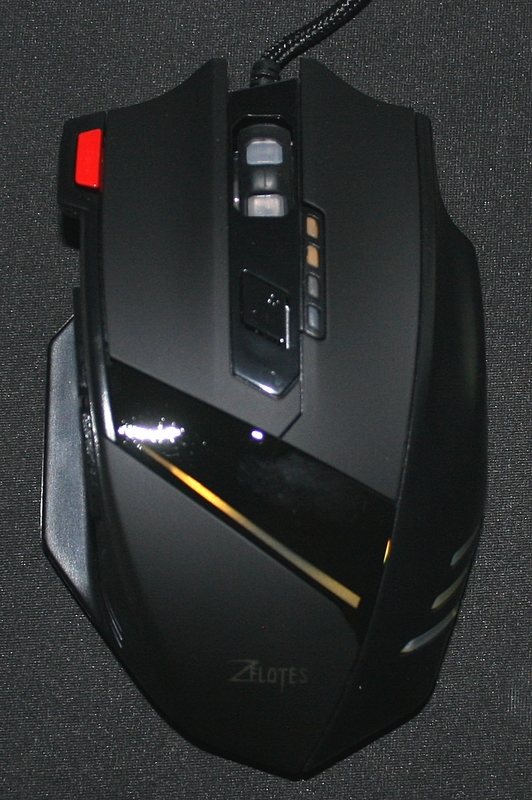 I was worried at first that this mouse would be above my head in terms of complexity – but to be fair – it has a normal wheel, two mouse (left right) buttons and apart from that – just what is shown above – nice extra features but nothing complicated to understand, just a couple of things to get used to really. Love this mouse, and it looks the part next to my computer aswell! - None - love it.